My Spa Water Obsession was posted on August 10th, 2012 and is filed under Drinks & Smoothies, Recipes. This entry has 11 comments. You can follow any responses through the RSS 2.0 Comment Feed. It must be the hot sun, but lately I’ve been drinking water ALL the time. I just can’t get enough. Of course, this delicious beverage makes me want to drink more. I’ve heard a lot of good things about how spa water (or “sassy water”) is great for boosting weight loss, improving the taste of water, detoxification, improving digestion, alkalizing the body, and obviously, getting hydrated. I felt that drinking this fruity water had me craving water more, which is always a good thing. Makes 1 pitcher. Make sure to wash all the fruit really well, especially if it isn’t organic. Fill a pretty pitcher with water and add the fruit. Let it sit in the fridge to absorb the fruit flavours or drink immediately. I just kept adding water to the pitcher all day long, by the third day I needed to refresh the fruit, but I used the same fruit for two days of refilling. You can just stick it in the fridge for a cool, delicious beverage to drink from all day long. I want this all summer long! Next time I’m trying freshly juiced lemon and fresh, organic spearmint from the garden. Sounds so refreshing! 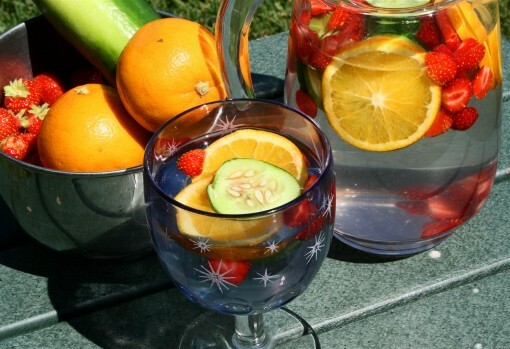 For more hydrating recipes and ideas, check out my other flavoured water post! Can you think of some good flavours that would be delicious in water? Do you like the hot weather? i like this water! it’ great idea! this looks amazing! So much better than plain old water! I just got into lemon in my water. Baby steps. LoL! We have a huge mint patch at my house though. I guess I could try that? This looks so great! I love adding frozen lemon (or orange) slices to my water, in place of ice cubes. Refreshing! Getting your “tankini” on. Love it <3 Tried to vote for you in the contest, but unfortunately, it won't let me because I'm not on Facebook. It is my favorite photo though. Good luck. I'll try to get my family members who are on Facebook to vote. Ohh, that looks really pretty. I’d love to make this for an upcoming picnic. So pretty, and I know it’d be refreshing. This looks so refreshing! I live in Florida, so it’s always hot. I don’t like the mid summer heat. It’s so draining. Looks really good and I like that you can use the fruit for a couple of days. I love this! So pretty, and looks so refreshing :D Oh, and I just voted too, good luck!